The best of both a tank and tankless water heater combined into one superior unit. The Crossover Wall allows you to enjoy the benefits of a high efficiency unit without surrendering your need for endless hot water and abundant water pressure. 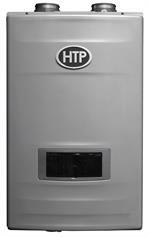 The crossover design prevents spontaneous bursts of cold water, which are typical for most tankless water heaters. As user demand increases, the Crossover can provide hot water at higher pressures for multiple fixtures and has built-in recirculation capabilities. The Crossover Wall combines the flow capacity of the tank with the continuous flow of the tankless and has none of either drawbacks! The Crossover's fire tube design prevents spontaneous bursts of cold water, which are more typical for most tankless water heaters. As user demand increases, the Crossover can provide hot water at higher pressures for multiple fixtures. The Crossover also features dual activation by flow or thermostat unlike traditional tankless. The Crossover does not require a .5-.75 GPM for activation so the unit is guaranteed to deliver hot water even with low flow fixtures. One of the most important features of the Crossover is its ability to provide endless hot water at the fixture due to its built-in recirculation capability. This unit uses an internal pump and an intelligent control system which can recirculate water through the plumbing system. It has three operational recirculation modes - Pulse, Smart (Auto Learn) and Time Sequenced. The Crossover Wall is made with an advanced hi-fin heat exchanger designed for superior performance and up to 96% thermal efficiency and up to .94 UEF. It has a durable 316L stainless steel with up to a 3.5 gallon fire tube heat exchanger and provides zero flow activation and scale prevention technology. The Crossover is a wall mounted unit to save space and has built in recirculation pumps with bottom connections. The Crossover's Multifunction Control Panel features a customized temperature control system. This control system includes a user friendly flow control, flow sensor, and a heat capacity control system. These controls work together to make domestic hot water even more comfortable by maintaining constant temperature while the unit is in use. The Crossover has up to a 96% thermal efficiency rating, meaning that for every dollar spent on fuel, up to 96 cents is used to heat your hot water. This is a great savings! The industry average is as low as 70% for standard tanks and 84% for tankless water heaters. HTP’s Crossover can be used in both residential and commercial applications. The Crossover can be used in several applications, such as recirculation lines, solar water heating and geothermal applications. The Crossover has top vent connections and can be vented with ULC S636 Polypropylene, PVC, CPVC or Stainless Steel vent materials. Its total combined equivalent length, including fitting allowance for both intake and exhaust shouldn't exceed 100' in 3" pipe or 50' in 2" pipe.